This original hand-pulled color-reduction woodcut features lots of black birdies. The title is, "Ellie in the Middle"
Starlings were introduced into America because a man named Eugene Schieffelin wanted to release all of the birds mentioned in William Shakespere’s plays. His biggest success was the starling. I am in the process of writing a non-fiction children's book about the journey of starlings from the UK to the United States and originally I thought I could incoporate my doggie with the story, but, as much as I love him, I kept him out. 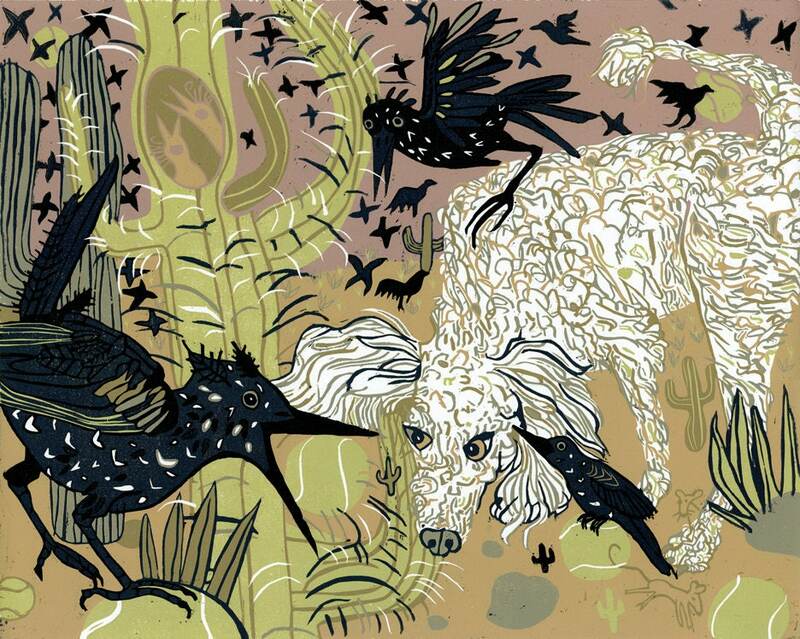 Now I have a few lovely poodle/black bird prints. image size 19” x 23.75” Paper size 30" x 22"